I hope you are enjoying the Easter holidays as much as I am. It’s so refreshing having these two weeks off. I know those of us half way through the DIP badly need it! I posted on my Facebook page last week asking if a blog post pertaining to Irish games to play in class would be useful. Over 700 people responded so I feel quite a bit of pressure now to come up with loads of brand new games! I can only share what works for me, and what I have used thus far. It is a year exactly since I qualified- so here are the games I have picked up along the way! So these games are for the senior classes, but of course they can be used for other classes if made slightly easier. Apologies in advance for sharing the obvious ones, but you never know, there could be a teacher out there who has never heard of Deir O’Gradaigh! (Simon Says in Irish). I play this with 5thand 6th class, but I just make it almost ridiculously hard. I start off with commands such as ‘bigí ag rith, léim’ etc, but as the game goes on, the vocabulary becomes more difficult. I like to make full sentences out of it too, and sometimes stories. E.g. 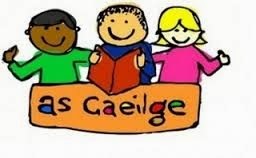 ‘Bígi ag rith síos an bother, thit ar an talamh, ghortaigh tú do chos, chuaigh tú go dtí an ospidéal and so on and so on. The children act out the sentences then. I tend to use the vocabulary we are studying and I base it on the story we are using that week. Again, an obvious one but make it very difficult and use funny or current images. I have over 30 images on my Cluiche Kim power-point, and some children still figure it out! A firm favourite in my room, again, because it is SUCH A BIG DEAL! Two children stand at the front of the classroom. We have a score board, and we have a timer. We have three children who keep count of the words and the amount of words our two opponents use, and we have a time keeper. The two children who are ‘on’, have to compete to see who can think of the most words on a certain theme, within the time frame, which is usually one minute. The winner’s name and score goes on the score board, and we see who has the highest by the end of the week. I have a number of Irish words printed out and laminated. I hide them around the classroom, and the children take turns looking for them. I don’t have the whole class looking at one, as that would be mayhem. Instead, they take it in turns daily based on their table groups. So four children look each day. Again, we have the timer set. We record the amount of time it takes for each team to find all the verbs, and translate them. (don’t do the translation part in front of an inspector!) Whichever teams has the lowest time for finding the verbs at the end of the week wins. I hide them in really tough places. Remember to set a timer though otherwise it will go on for too long. I give five minutes to find 20 verbs. The children then have 2 minutes to translate five verbs each. It is really good practice I find. I know we shouldn’t have translation as part of our Irish lessons, but it does help them remember the verbs. I got this idea from my Prim-Ed book, in which the children are given a picture, and you are given instructions- which you call out to the children. E.g. ‘colour the lion’s mane orange’. I found the resource great when I had 4th class but I felt 5th and 6thfound it a little tedious. Instead, I call out mini stories in an extremely dramatic tone, sometimes with actions (if it is a difficult one) and the children draw what is happening in the story. Again this is mainly for verb practice. I started off with very simple three sentence stories but mine have worked up to seven or eight sentences now. So, for example ‘the monkey went to the shop. He bought three bars of chocolate. He ate them and fell ill, and he had to visit the doctor. The doctor gave him a big injection and he never ate chocolate again’. As you will be saying this in Irish, I would say it very, very slowly, and repeat it three times. Also give them time to draw the images. a comic strip works best) Also use actions for the children who may struggle with the task. I don’t think it needs an explanation! It’s not a bad one if you are stuck for time. 7. Chuaigh mé go dtí an siopa agus cheannaigh mé’…. One child may say bainne, then the next has to say bainne and their own, so bainne agus subh and so on and so on. I personally cannot stand this game, it takes so long and is so boring! This isn’t really a game, but sometimes I write up all the verbs we have learned thus far on the whiteboard. The children put up their hands if they know the verb, and they are given that verb to write out on a piece of card and decorate. The verb can go on the Irish display or in their folders. It is great for verb recognition. I would recommend doing this maybe once a week, and make sure no-one gets the same verb twice. Have a number of pictures relating to the story of the week and vocabulary printed and laminated. Hold the images up for the class to see. The first person to put their hand up and give the correct answer, gets to hold the card. Whoever has the most image cards at the end of the lesson wins. Images may be of food, school words, clothes, animals, anything. It is a handy game for their weekly spellings too- if you use their spelling words all the better! I have a number of images on a power-point presentation. Mine are an odd collection, of cartoon characters, my pet dogs and video game characters. I put one image on the IWB at a time, alongside a verb. The children then volunteer to make up a sentence about that character using the verb, and as many others verbs as they wish. This was a hugely popular game! I hope these games help. I absolutely adore teaching Irish. I just yearn to make the children enthusiastic about it too. But enthusiasm is infectious, and if you are loving teaching the lesson, then hopefully the children will get caught up in it too. I know a lot of my games focus on verbs and verb practice, and that’s simply because I am doing a lot of verb work lately! 1. Start with an active game. 2. Introduce the new vocabulary at the start of the lesson. Have the words written out on flashcards. Hold the flashcard up to the children and have them say the word in unison. I’d have maybe six or seven flashcards. Do the same thing at the end of the lesson. 3. Have a little dramaí beaga somewhere in the lesson, even if it only involves a three or four children. Tell the supervisor the children take turns throughout the week. 4. Use concrete materials- if teaching about food have a bowl of real fruit. If teaching clothes vocabulary- have a bag of clothes, e.g. hat, scarf, belt etc. Use these as your main teaching point. 5. Finish with a song or a poem- have the children perform it for the supervisor. Simple but really effective! Thanks Muinteoir Valerie?